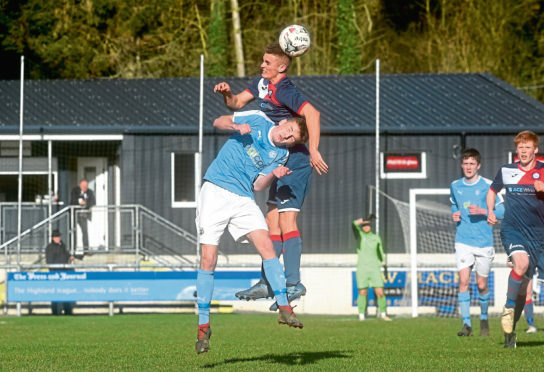 Turriff United threw away a two-goal lead as Nairn County scored three times in the final 14 minutes to claim the points and move a point above the home side into 13th. Goals from Callum MacLean, Adam Porritt and Liam Shewan cancelled out counters from Owen Cairns and an Angus Grant penalty, which Nairn manager Ronnie Sharp reckoned should never have been given. He said: “It looked like the referee was going to book Michael Ewen for diving after going down six yards from goal following a tussle with our goalkeeper Dylan MacLean. Sharp was full of praise for his young side as they have been on their travels to Huntly, Wick and Turriff in the past seven days. And claiming six points from these three games was a great reward from three difficult venues. He said “We shouldn’t have been behind as the first half was pretty even with the two goals early in the second half against the run of play as we had created good chances. Turriff manager Kris Hunter was disappointed to see his side blow a two-goal lead and admitted a mistake from goalkeeper Fraser Hobday allowed Nairn back into the game. He said: “Fraser should be doing better as I also feel he was at fault for the winner after racing from his line as the Nairn player was going nowhere fast. “Fraser has been good for us this season. “But really our troubles started from a throw-in 20 yards from the Nairn goal which we have worked on at training and unfortunately some players did not take on board what we asked of them when we are in possession of the ball. “My players need to start taking a bit of responsibility as we have thrown away points due to not doing the basics. Turriff went ahead in the 49th minute through Owen Cairns’ eight yard angled drive and doubled their advantage after 65 minutes when Angus Grant fired home the penalty given for the foul on Ewen. Nairn pulled one back after Hobday dropped a corner, allowing MacLean to score from close range with 14 minutes remaining. And when substitute Porritt fired home from 10 yards nine minutes later, there was only going to be one winner. Nairn scored the decisive fifth goal with three minutes left through Shewan, with the striker beating Hobday to the ball to roll it into an empty net from 20 yards. The victory means Nairn have 32 points from 29 games, one point more than Turriff, who have played two games more.